I wanna be friends with stickman. My parents bought us a beautiful, shiny new playhouse when I was about 9. It had a door, double-hung, screened windows that opened and shut and it was even carpeted. What did we do? My sisters & I chased each other around it, jumped off the roof, colored it, planted vines on it and did just about everything but play in it. Instead, we would head into the woods behind our yard and spend hours building our own structures- weird, branch teepees with moss floors, listing every which way and collapsing at the first big wind, at which point we’d just start over. If only GoldieBlox had been invented way back then! Can’t wait to see where this company goes in the future- I’m hoping more complex kits, instruction manuals with additional building ideas, more colors, boy figures (how about a little brother sidekick? )… Hey, GoldieBlox, need a layperson consultant? If you want to read about one expert’s opinion of inequality in “The Toy of the Decade,” and the toymaker’s commitment to review, and hopefully change for the future, click here. Special Gifts Theatre, is a very special place, indeed. Located in the north suburbs of Chicago, SGT provides a unique experience for children who may otherwise not have the opportunity to participate in a drama experience. 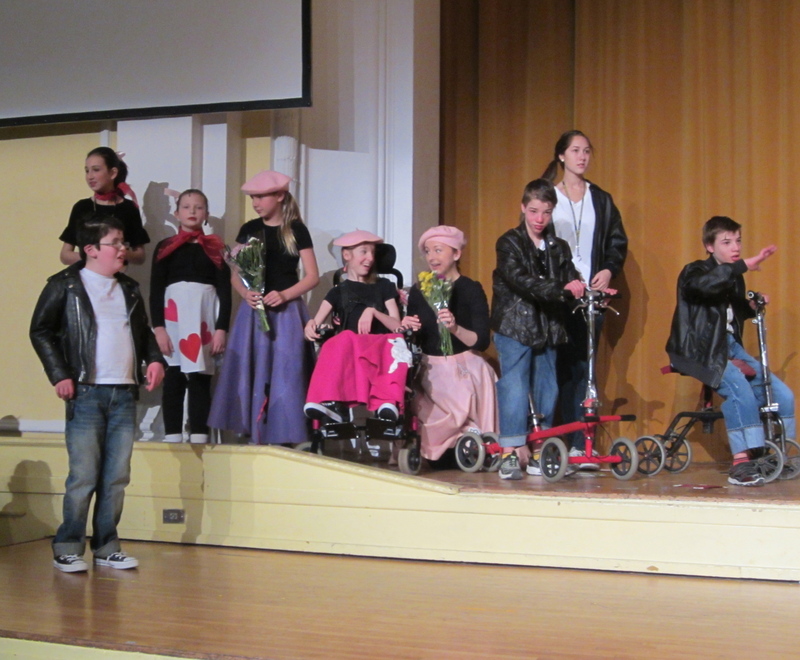 For months the special ed teachers, therapists and theatre arts instructors, with the help of peer mentors, guide the two casts of children with special needs to perform in two spectacular shows. This year’s show, Beauty and the Beast, has an especially amazing actor playing the part of Chip! To learn more about the history of SGT, click here. Thanks to all the people at Special Gifts Theatre for making this such an amazing experience for the children who participate and their parents, too. Merry Christmas from our Crazy Characters! This makes me appreciate my own mom & want to be a better one. How in the world can you make a trampoline accessible? 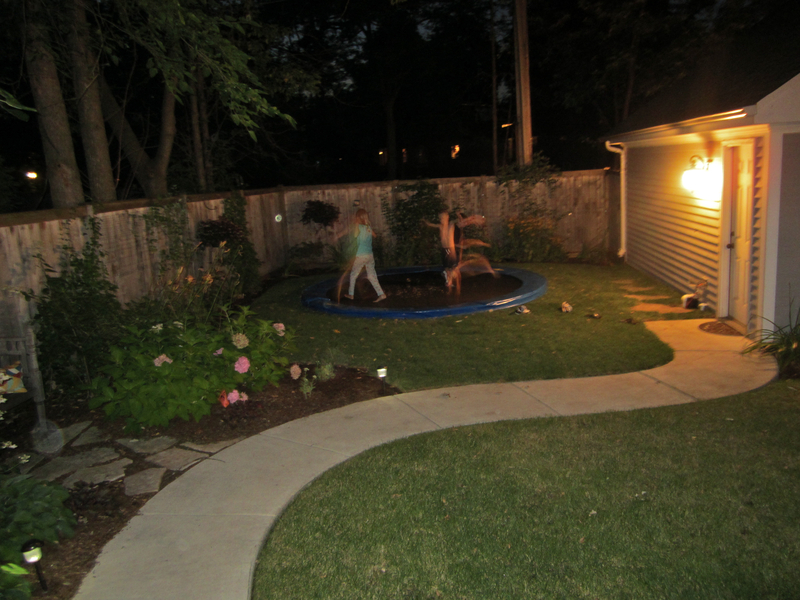 Thanks to one of Meredith Sinclair’s (Hoo-dee-Hoo) tweets, I found the perfect solution in an in-ground trampoline. Didn’t take much convincing of Otis Carter (Carter Albarran Landscape Group), our amazing landscaper, to give it a try. Now, our guy with cerebral palsy can walk right out onto it & bounce to his little heart’s content. We might be the only people here in the arctic, snowy climate of Chicago to have attempted a pit trampoline- we’ll see how it fares after a blizzard or two. For right now, it’s just a lot of fun.